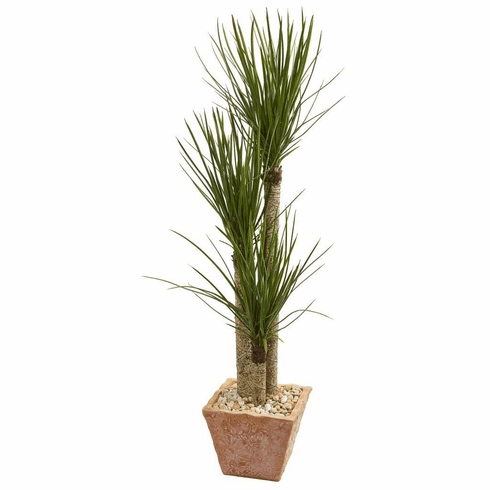 The five-foot artificial yucca tree's three heads of sharp green leaves stand at eye-level, making them easily visible in any room you place them in. With a terra cotta planter included, this artificial tree will fit right in with your living room, dining room, or kitchen space's Southwestern inspired arrangement. If you select the former, then place it beside your couch or favorite chair for a nice finish. Height: 5 Ft., Width: 23 In., Depth: 23 In., Color: , Pot Size: H: 10 In. W: 12 In. D: 12 In.